Increase employee engagement and sales motivation with a leaderboard. A bit of friendly leaderboard competition can light a fire under your sales team, customers or employees. Ready for a fired-up team? Let’s talk leaderboard strategies! The Leaderboard Module brings out your sales team’s competitive side. For some people, nothing’s more motivating than being able to say, “I win!” Using a leaderboard to boost employee engagement and sales performance is an effective way to tap into an inner psychological and emotional drive to be seen as the best. You can use an incentive program leaderboard to rank top performers in your latest sales promotion or sales contest, or create employee competition to increase productivity. The Leaderboard Module will transform your company culture into one in which everyone puts in maximum effort. What are the features and benefits of The Leaderboard Module? Increase employee engagement or sales performance with friendly competition. Choose a standard leaderboard, or an interactive leaderboard with additional personalization and display control features. Rank by org chart within specific program participant types, such as those in particular regions, departments or organizations. Automated ranking gives your sales team a convenient, up-to-date view of their standing in your sales promotion. The Leaderboard Module helps you solve these pain points. 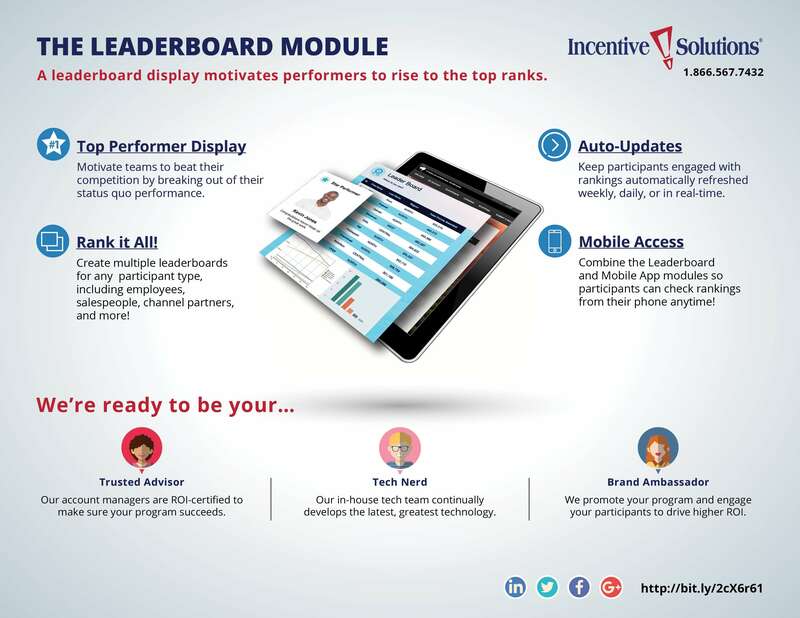 Which types of incentive programs should use The Leaderboard Module? The Leaderboard Module can add the spice of competition to your employee motivation or recognition strategy. What better way to motivate your sales team to beat their personal best and feed their egos than displaying a sales leaderboard? Get the most out of The Leaderboard Module by pairing it with these other modules. The Performance Tracking Module allows you to manage, schedule, and track performance of multiple sales promotions. You can rank the top performers in these promotions using The Leaderboard Module. Learn more! Rank the top earners of on-the-spot reward points on your leaderboard! Learn more! Give top leaderboard spots to those who pass the most quizzes, submit the most surveys, or are most active in daily trivia. Learn More! You can grant different levels of incentive program permission and access to those in your org chart. Paired with The Leaderboard Module, managers can control the leaderboard for their own team, department or organization. Learn more!